Another Signature Hat from ELK Studio with an Added Bonus! I’ve loved making my Southern line of hats and just couldn’t see myself “putting” the creativity away because summer is practically over and everyone is now ready for fall. Anyone can see from perusing through the pages of Facebook and blogs that people are gearing up for the colder months and excitement is in the air. Well, so am I but…..my summer hats, I love making them. So, what is a crocheter to do when the climate and custom orders begin to change? I do what we, (crocheters) do best and become creative. I’ll satisfy my inner need to make my beautiful sun hats while meeting the current seasonal demands. How? The classic ELK Studio style summer hat along with a short brim version. I’ve had a few people ask me if I designed hats without requiring the use of millinery wire. I listened and it’s included with this pattern. (The flower in the short brim picture is not part of the pattern but is a modified version of Teresa Richardson’s pattern. Here is a link I provided in an earlier post. A winter version to include small, medium and large instructions. A headband version with an added bonus. 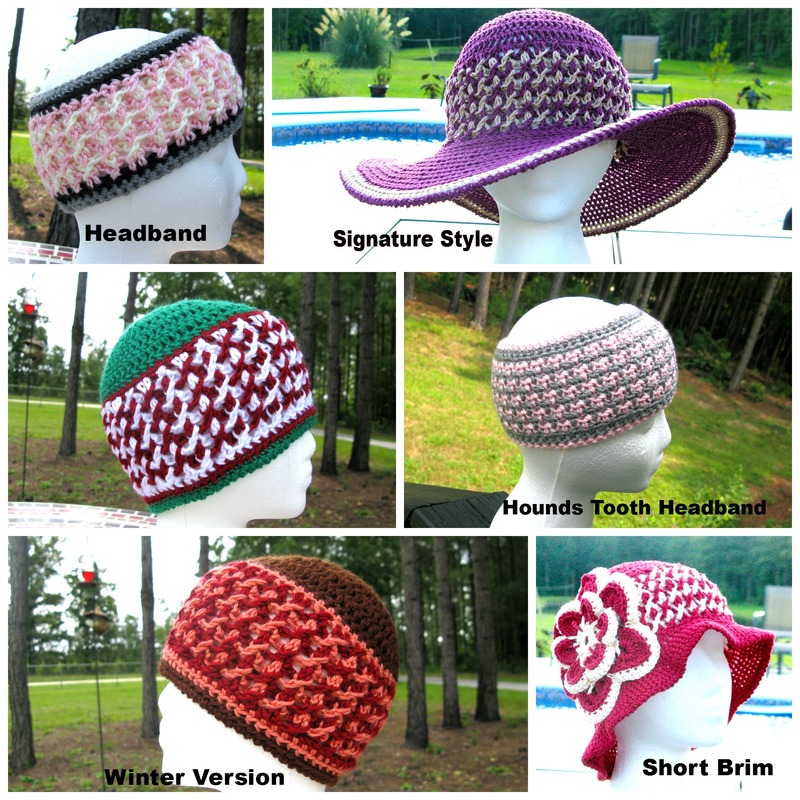 Everyone has loved the Hounds Tooth hat, scarf and tote, so I’ve included a free Hounds Tooth headband pattern! A scarf and boot cuff pattern. So many great accessories to add to your bucket list! There is enough there to keep you busy for at least 2 days right? I know how fast some of you crochet……. Are you ready to see some of the accessories? The boot cuffs and scarf are still a work in progress but here is everything else! The first pattern released from this series will be the Winter Version style and should be ready within the next few days! I hope you will enjoy this pattern as the testers have done a great job to help me make this hat series fabulous! I haven’t name this hat yet and decided that it will not join the “Southern” series, so if you have a great name in mind, let me know. I’d love to hear your suggestions! Be sure and stay tuned to the blog or ELK Studio’s Facebook page for updated information about the new pattern. That hat is amazing! I love it. And the headband will be great for the winter. Very cool head coverings for the worst of all weathers. You are showing all your talent in one blog! Great! Ok girl, slow down, I’m dizzy. great work. I am loving it! It’s been fun and I appreciate your hard work helping me! I absolutely love the headbands… I love all of it,,, But, Wow,,, The headbands are awesome! Cant wait for scarf and Boot Cuffs too! Nice stitching technique!